Always remember that title girls! There's no fooling anyone here... I absolutely LOVE eyebrows! They just compliment your face so much (so long as they're done right of course). Now I always look at peoples eyebrows (especially in make-up tutorials). I just do not understand why people shave them off? They end up making them like an inch long?! Just so they can create those big magnificent eyebrows. Imagine how bad they look when you pull out a wet wipe?! Ouch! I remember being in secondary school and the in thing were to pluck your brows to death. The thinner the better! Is it just me that looks back at school photos and cringes like mad? Not only did I have super thin eyebrows.. I had my hair scrapped back with the two teeny tiny strands of hair coming down the front and I were the biggest tom boy known to man kind. It's crazy how much you change once you leave school haha. Ok so my natural hair colour is a really mucky blonde colour, which means my eyebrows aren't the darkest. Thank god for hair dye! I like my brows to look a little darker, but not too dark for better definition & everyone wants to look good without their make-up right? (I can only dream) haha! Before I start, please make sure you do a skin test 48 hours before applying this to your face. I know not many people follow by this rule, but it's a must! I once had an allergic reaction to hair dye that made my whole face swell up for days, I looked like the elephant man & I never want that to happen again. 1. Apply Vaseline to the places you don't want the dye to get. 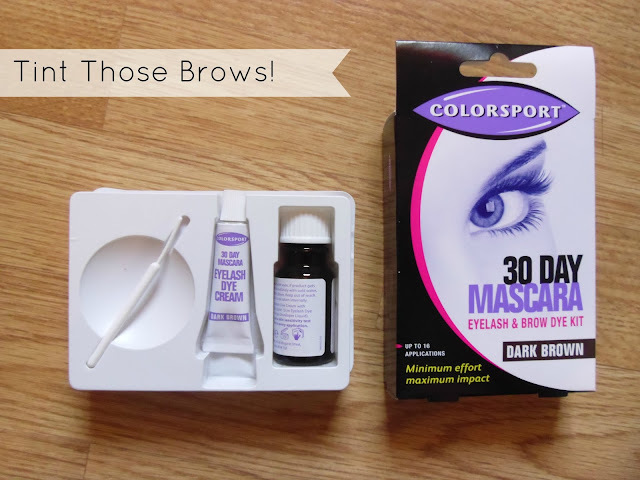 Brows - Place around the eyebrow so that it can be wiped away easily. (If you haven't got the steadiest of hands.. this is a must! It does stain the skin). Lashes - I put this above and below my eyelids where your mascara stains would tend to usually go in Summer. It only takes a look in the wrong direction to end up all over the place. 2. Mix together the dye and the developer that you will receive in the tinting pack, until it is a thick and creamy consistency. I usually place just short of 2cm of dye and about 8 drops of the developer. 4. Give it time to develop (10-15 minutes) Mine were a ten minute quickie and that was just for the eyebrows. When you tint your eyelashes you can leave it on for up to 30 minutes. 5. Wipe it all away, make sure you get it all off and WAH LAAAAAH! What beautiful eyebrows & eyelashes you have my dear. Here is a before shot of my eyebrows when I've not dyed them for weeks and weeks and then an after shot from a quick 10 minute tint. This is the dark brown tint, sometimes I go for black if I want a more defined/bold eyebrow and obviously leave it on for a little bit longer. & please excuse the bushy brows! I'm in the middle of growing them. Some of my friends and family go for their eyebrows and eyelashes done at a salon, but if you want to save some extra pennies. I really do recommend this little box, you get so many applications out of it and it only cost me £4.99 or less from a body care store. Amazon is good for cheap tinting kits too. I'm all about saving. Have you ever tinted your eyebrows before? What do you use if so? Haha! You sound like me at school! I had the same thin eyebrows (why did we do it to ourselves?!) and the 2 strands of hair!